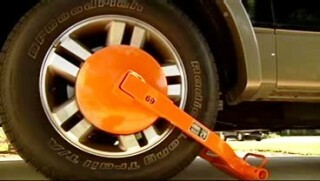 FORT MYERS: Some Fort Myers homeowners are battling their homeowners' association over vehicles that were booted on the owner's property. Rebecca Krueger is not a happy homeowner. When she tried to leave for work Tuesday morning, she noticed a boot was on her truck, which was parked in her own driveway. "I'm irate. I'm absolutely irate and I'm disgusted," Krueger said. "I can put my hand under it. It's not even actually on the grass." The security company, Whitestone Group, at Cypress Landings, said her truck was given a boot because it was not parked on a hard surface. But the tire was really only an inch off the driveway. And Krueger owns that inch. Now, it will cost Krueger $200 to remove the boot. "I went and got the association manager, brought him down here to look at it. He said he didn't think it was excessive, and that they boot at least one vehicle a night because they need to make up for the deficiency in funds from all the people that haven't paid their dues," Krueger said. "It's ridiculous. They've been doing it to a bunch of people," neighbor Mike Proffitt said. We tracked down the homeowner's association, who referred us to their attorney. The attorney said vehicles parked on the grass are booted to prevent costly landscaping and sprinkler damages. "I could understand and I would want them to boot it if I was parked over here - parked up on the grass," said Krueger. But she says the proof is in the pictures and pointed out that her truck tire was barely touching grass. 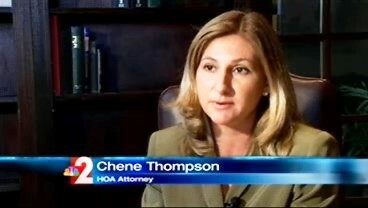 "In this particular case, we are planning to meet with the towing company and I will be contacting the homeowner and I will be inviting her in to have a meeting and we will discuss the particulars of this situation," said HOA attorney Chene Thompson. Thompson added that the homeowner's association always has the homeowner's best interest at heart. But Krueger said, "That's not looking after the homeowner's interest." Krueger and her neighbors say they're all for having a beautiful lawn, but they also want to be able to live - especially on their own property.